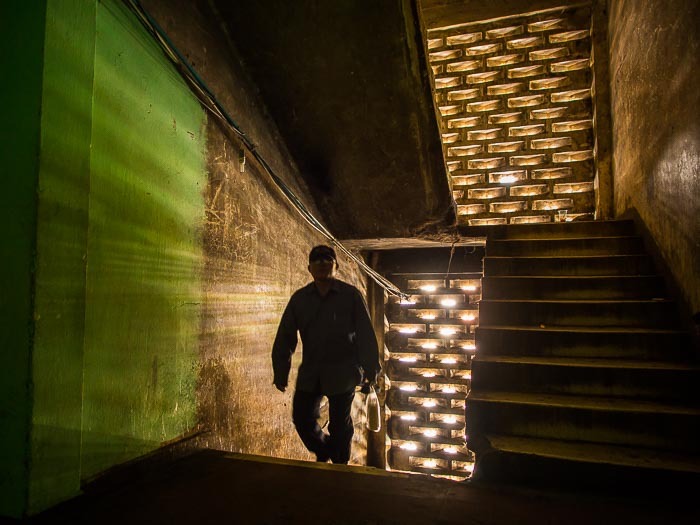 A man climbs a stair case in the White Building in Phnom Penh. The White Building in Phnom Penh was the first modern apartment building in Phnom Penh designed by a Cambodian architect. 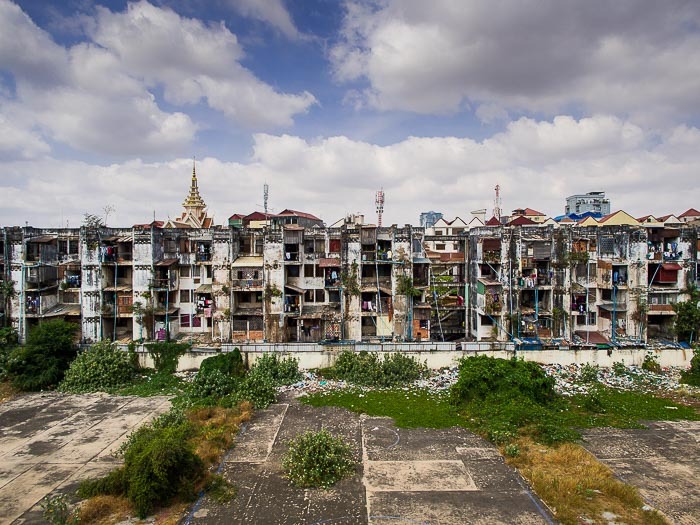 It opened to great fanfare in the mid 1960s, but like all of Cambodia, fell into disrepair during the dark years of the Khmer Rouge. After Vietnamese forces liberated Phnom Penh from the KR, people flooded back into Phnom Penh and the White Building. 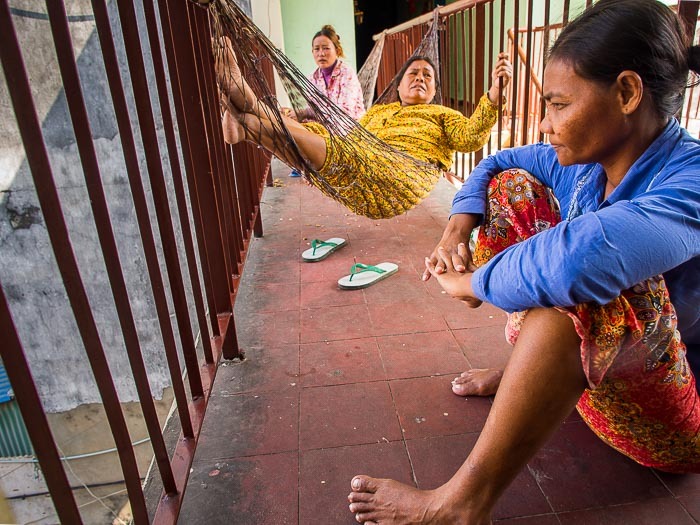 Women relax on a landing in the White Building. Between 2,000 and 3,000 people live in the White Building now. It hasn't been renovated or rebuilt and is in disrepair. But it's the only home many of its residents have known. 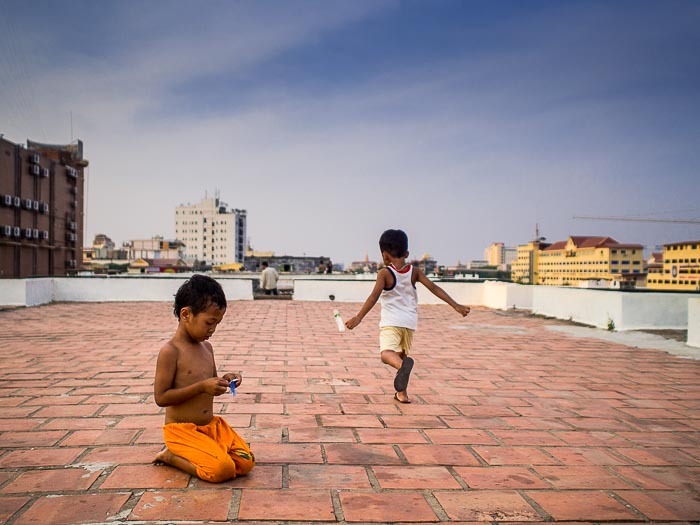 Some have lived in the building since their return to Phnom Penh in 1979 and 1980. A view of the White Building from the roof of a neighboring building. A monk on his morning alms rounds walks into the White Building. The White Building doesn't have a clear owner. Some of the residents own their apartments, others rent their apartments from absentee landlords. Some of the people who own their apartments have subdivided them and rent rooms. 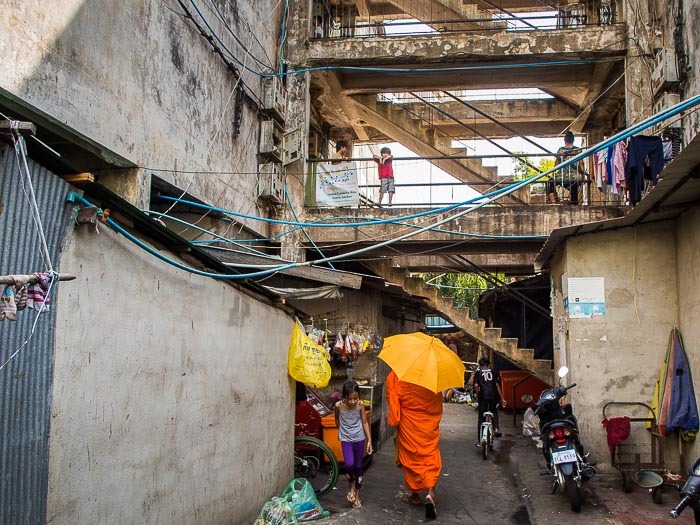 The Cambodian government wants to tear the building down. They say the dilapidated state of the building makes it unsafe for human habitation. They've offered to relocate residents to land about 20 kilometers away (12 miles) but for many that's not a viable option. The White Building is in the heart of Phnom Penh, making it easy to get to jobs in the capital. Cambodia has a barely developed transportation infrastructure and no bus or mass transit system. People living 20 kilometers away would have to take tuk-tuks or buy motorcycles to get into town. They might as well be living in Battambang or Siem Reap. 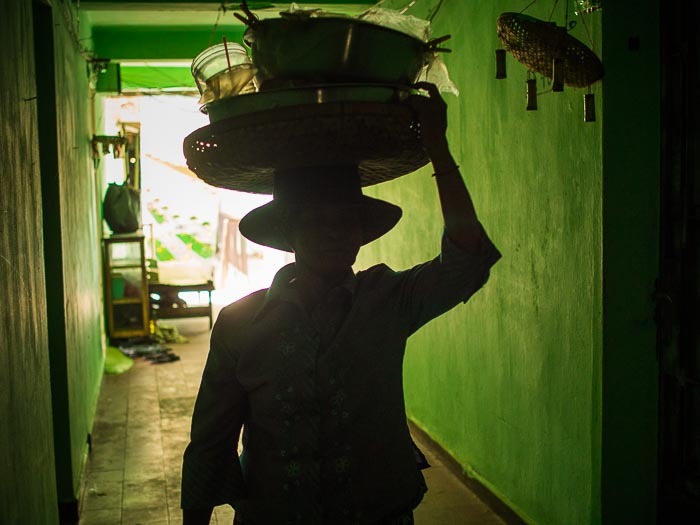 A food vendor walks through a hallway in the White Building. Residents are fighting government efforts to tear down their homes but it's unclear how long they will be able to stay. The building's prime location, in the heart of Phnom Penh, within walking distance of the Royal Palace and riverfront means there are people intensely interested in buying the land and building a shopping mall, high end hotel and expensive housing for foreigners and the Cambodian elite. 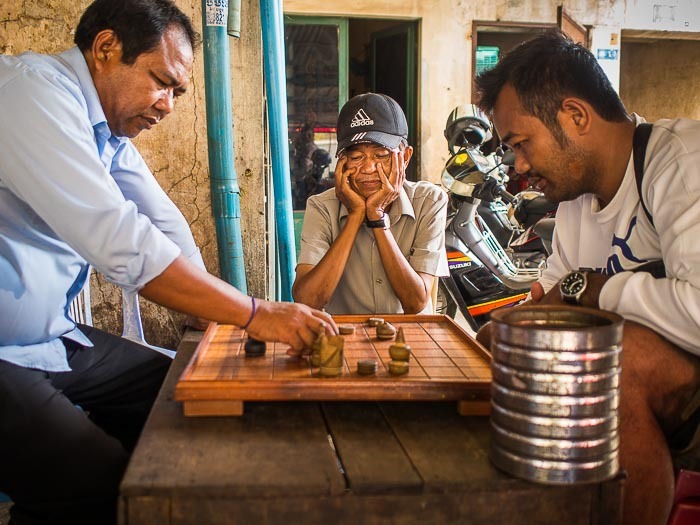 Men play chess in a coffee house on the ground floor of the White Building. 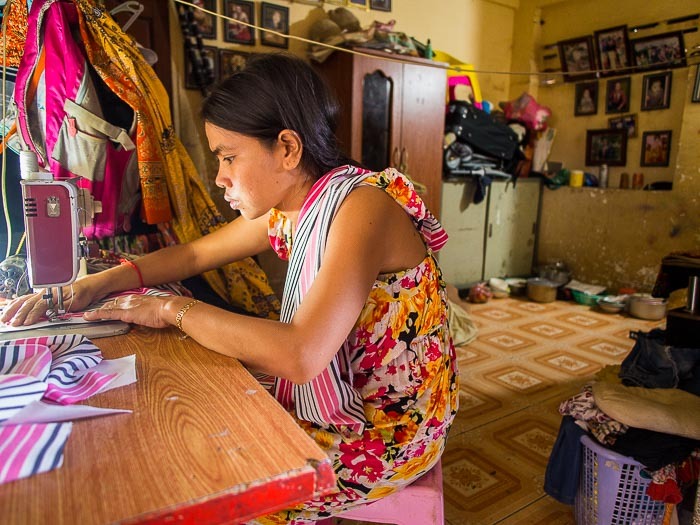 A resident takes in seamstress work in her apartment. There's a real sense of a community in the White Building. There are bars and restaurants on the ground floor. There are small shops and a school on the upper floors. Monks routinely visit on their alms rounds and to minister to people's spiritual needs. In the early morning and evening people gather on the roof for exercises or to socialize. 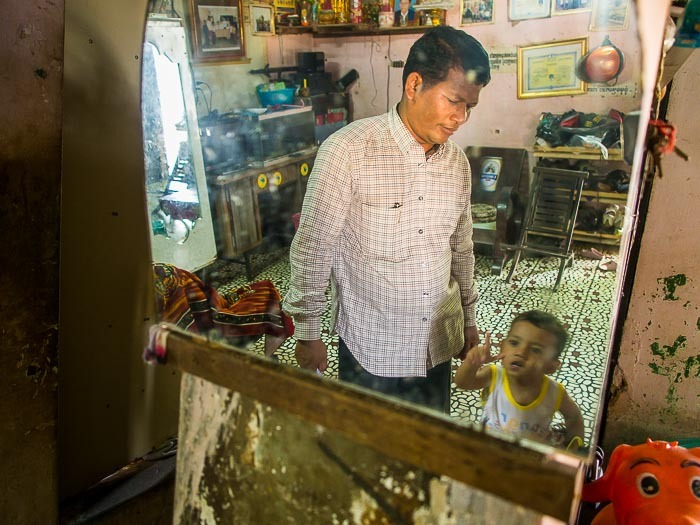 A retired policeman who has lived in the building since 1982 with his nephew in the man's apartment. He owns his apartment. Children play on the roof towards the end of the day. There are more photos from the White Building in my archive or available from ZUMA Press.